Mike’s Moving Tallahassee started over 25 years ago with hard work and a commitment to quality relocation of your household furniture. Through the years Mike’s Movers are still as dedicated to upholding the standards that make us THE MOVERS of choice in Tallahassee, that you can trust in for all your apartment, office and residential moving needs. Moving can be a complicated and stressful process. Mike’s Moving knows that our caring customer service has been a vital ingredient in being able to meet our customers’ needs. Mike’s Moving and Storage has worked relentlessly to earn a good reputation for providing quality moving services. We are proud to say you can trust Mike’s Moving and storage to successfully relocate your home or business. 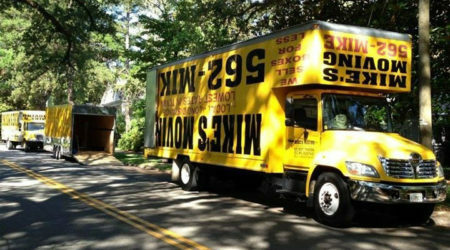 Movers in Tallahassee Florida For over 25 years, Mike’s Moving and Storage has become the top moving company in North Florida and South Georgia. From starting out with a few movers and one moving truck, we have built a foundation that begins with providing customer service that’s second to none. Today Mike’s Moving services the Tallahassee areas such as: Crawfordville, Thomasville, Woodville, Blountstown, Hosford, St. Marks, St. George Island, Carrabelle, Quincy, Bristol, East Point, Perry, Havana, Panama City, Sneads, Gretna and many more Tallahassee Florida areas. Mike’s Moving also services many Jacksonville areas such as: Atlantic Beach, Palm Valley, South Ponte Vedra Beach, St. Augustine, Butler Beach, Amelia City, Lake Butler, Fruit Cove, Bellair, Hampton, Sanderson, St. Mary’s, Callahan, Orange Park, Jacksonville Beach and many more in the Jacksonville, Florida area. Mike’s Moving operates in the Tallahassee North Florida area to be able to provide a personal touch to moving and storage needs on a daily basis. Mike’s Moving employees are put through extensive training to be efficient, skilled, and courteous movers. Mike’s Moving and Storage relocates thousands of people each year, but we never forget that each move is important to our success. Mike’s Moving is there for you every step of the way. Mike’s Moving and Go Mini Portable Storage provides our clients with an education on moving, customer service and most importantly helping hands so you know what to expect. Just give Mike’s Moving a call, or go online, and we will give you a free estimate that will better help you understand the moving process and help you better plan your move. Our expert staff is customer service oriented with a focus on customer’s needs. We have a 25 year history of very satisfied customers and have formed some great relationships during this time. Give us a chance to be your moving company and you will be glad you did. Or fill out our form HERE!